This is totally out of character for me. Really. I am not a girlie girl at all. I kind of feel like I need to pull up the pictures of me as a 4th grader, wearing camo pants and no shirt (because I was a total tomboy and felt like I should be able to run around half-naked) so I can prove my non-girlie nature here. I'm not really in to fashion and I rarely wear makeup, but the one girlie weakness I have is this: painting my fingernails each and every week. When I was in college, I painted my nails all the time - sometimes every other day. I'd use wild colors, but paid no attention to application or care. They were generally a sloppy mess. 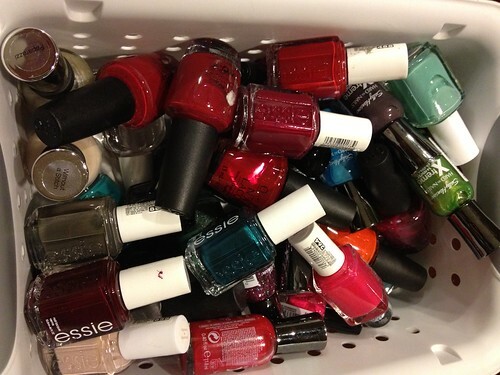 Once I had kids, my nail-painting habit died off, and I didn't touch the stuff for years. Then I had an embroidery class in which a student carried on about her nail-painting ritual. 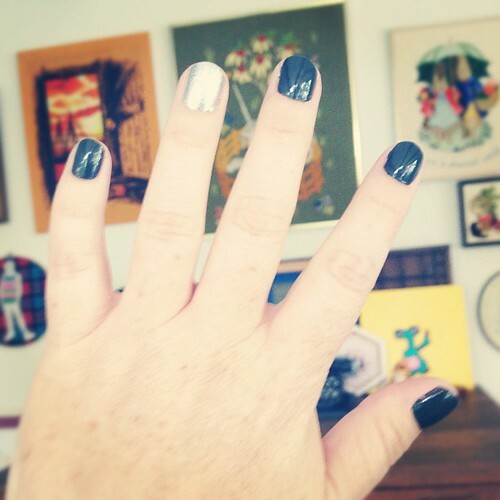 Her blog was the first place I saw the painted nails trend, and a post she did on her weekly ritual of painting her nails got me completely hooked again. Initially, I was painting them only occasionally. Several months ago, though, I got hooked on a weekly routine of painting my nails every Thursday night while watching 30Rock, Big Bang and Project Runway. I love the colors. Sometimes it's as simple as that. For as much black as I wear, I am always drawn to the menagerie of colors available in the nail polish aisle. I have a basket full of colorful bottles, and digging through them is deeply satisfying to the color-hungry part of my soul. 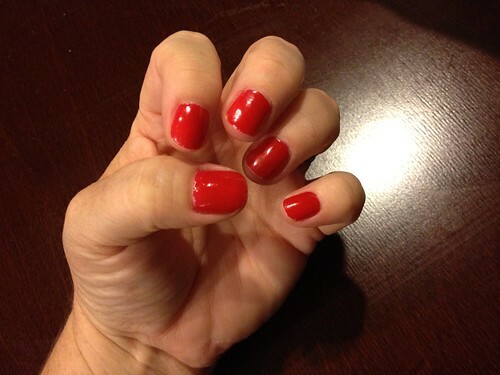 Seeing a nice color on my hands every day is - as silly as it sounds - a little pick-me-up. It's a simple form of self care. The whole moms-neglect-themselves is a cliche for a reason. It's hard to find much time or money to do a little something special for yourself, and my weekly manicures help in that regard. I'm taking time to take care of myself, feel "pretty" and indulge in something that's a bit impractical and makes me feel good. We all need more of that, right? I can't multitask while I'm doing it. Aside from watching tv, I really can't do much else while I'm painting my nails or waiting for them to dry. After I finish painting them, I sit down on the couch and just allow myself to watch tv for the rest of the evening. I don't do dishes, fold laundry or work on the computer. This is pretty much the only time in the week that I just sit still. That's a beautiful thing! After digging around on the internet, and buying more beauty products than I'd care to admit to, I settled on a handful of favorites and a routine that give me a nice-looking home manicure that lasts all week. 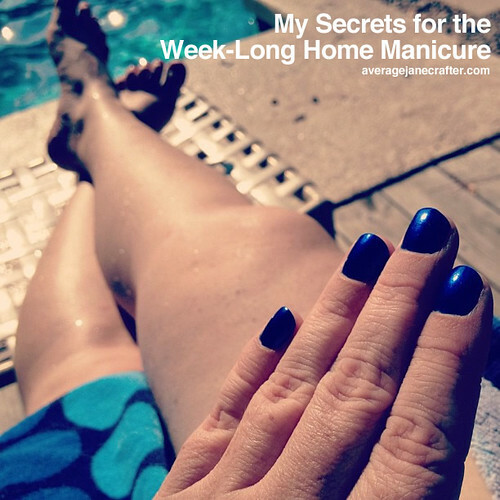 * My frequently-changing manicures have been visible in many of my pictures on Instagram, and I had several friends ask me to post my method and favorite products. There are thousands of nail-painting tutorials on the internet, but most of them are for fancy decorative nails. I haven't had time to do anything like that, nor do I strive to. The basic solid color manicure scratches my itch just fine, but just know that if that's something you desire, it's easily found with a quick google search or look-see on YouTube. Enjoy the tutorial, and find some way - even if it's not painting your nails every week - to do a little something for yourself that allows you to not multitask while you do it, ok? Here's a picture of my week-old manicure. On this particular week, I'd even cleaned out the garage over the weekend, and the polish still held up nicely. It's not perfect at this point, but for having been on my nails for a solid week, I'd say it's not to shabby, amiright? 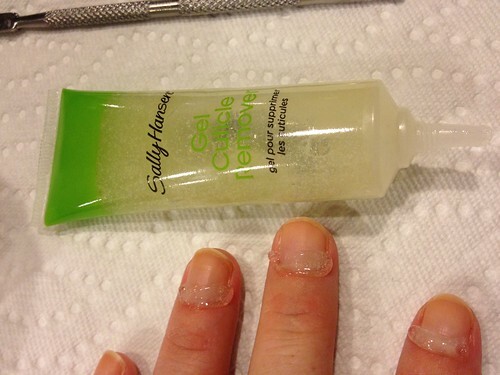 Sally Hansen cuticle remover gel - I've used this one, as well as the SH instant cuticle remover. I like them both. 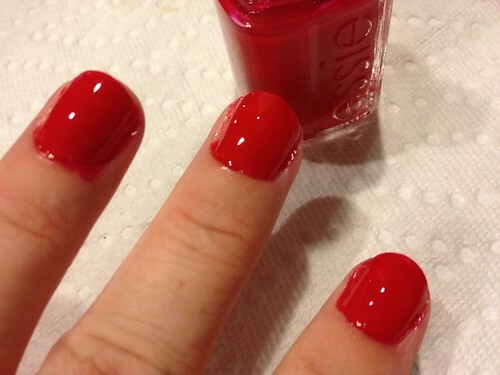 Sally Hansen Miracle Cure - for the base coat. This stuff rocks. Out The Door top coat - this stuff is what seals the deal (literally) on a long-lasting manicure. I found it at Target for around $3, but have had trouble finding it there recently. I know you can get it at beauty supply stores, it might just be a little more expensive there. LOVE this stuff. Nail brush - It's freaky how handy this thing is. I hadn't used one before, but now adore it. 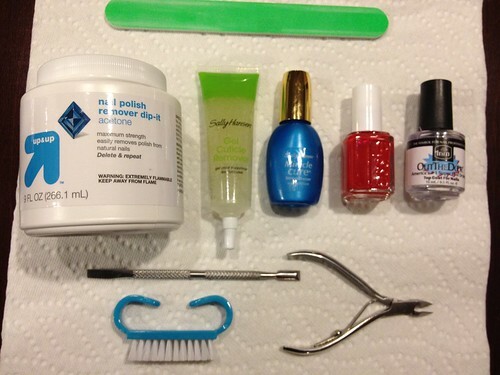 Let's start with removing your old nail polish. Part of why I didn't paint my nails much was because removing the color was a huge pain. I'd have stacks and wads of cotton pads all over the place, and the color would inevitably end up all over my hands. It was an annoying mess. At the risk of sounding like a commercial, this product changed all that. Remember that stuff from the 80s that was a dip-and-remove nail polish remover? 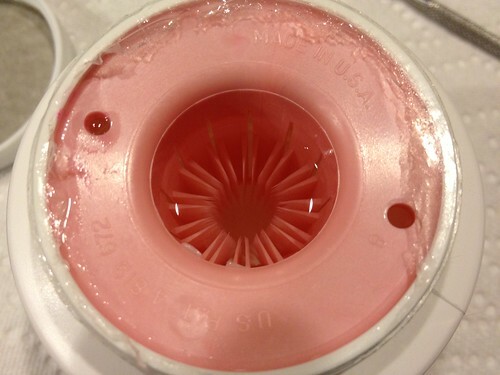 It was like a sponge inside a container and you shoved your finger down in it and rubbed off the color? The color often did the same thing as it does with cotton pads: gets smeared all over your fingers. Because of my experience in the 80s, I was hesitant to try this dip-and-remove from Target. Instead of the old sponge interior, it's full of plastic bristles. 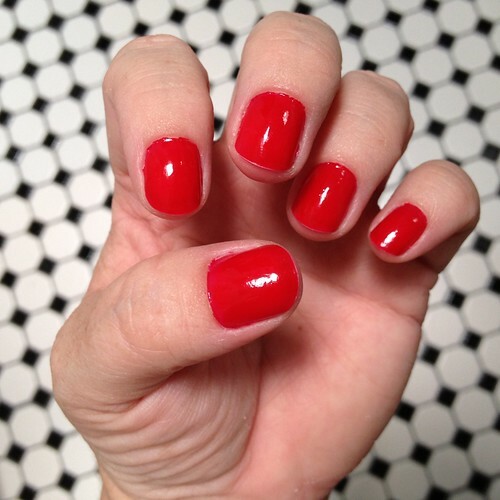 Instead of smearing color everywhere, the polish comes off in just a few swipes and leaves your fingers perfectly clean. I nerd out on this stuff big time. Sure, it looks like a Sarlacc from Star Wars, and yes - I snicker and make 12-year-old boy jokes every time I shove my finger in it - but it works wonders and I'm sticking with it for the long haul. 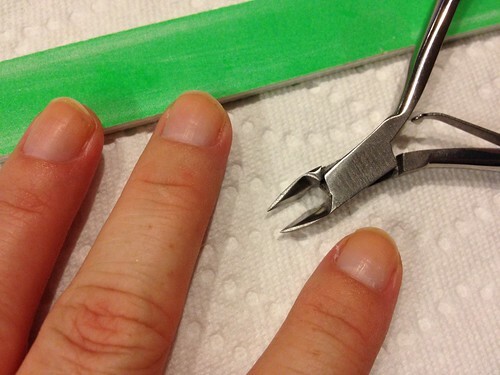 Use your cuticle stick to push back your cuticles. At this point, I like to file my nails. I couldn't get a picture of this part, but it's pretty basic. Just gently shape your nails with the file. I've seen tips about filing only in one direction, but honestly couldn't get that down. Just don't go nuts and don't use too coarse of a file and you should be fine. Once your cuticles are all pushed back and nails are filed, it's time to hit the sink. Again, I couldn't get a picture of this, but what I usually do is squirt liquid soap in to the palm of my hand and then dip the finger nail brush into it and scrub my nails pretty vigorously under the water. 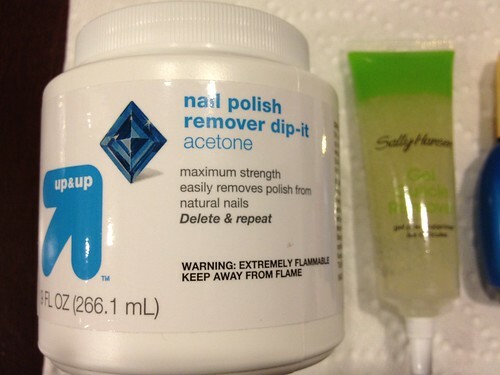 This removes the gel and the residual acetone (that can dry out your skin) and cleans up under your nails from filing. Dry your hands well after washing. You can then use your clippers to clean up any gnarly bits that are left around your nails. 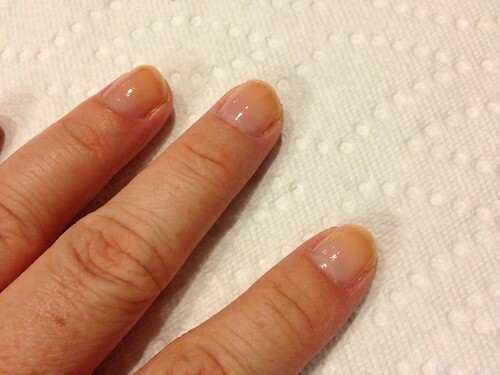 Paint a nice, thin coat of your base coat on to your nails and let dry. Usually, by the time I finish my second hand, the first hand is dry enough to dive right in to the color coats. Now it's time for color. I don't really have any tips for applying color other than be patient and paint thin coats. Globbing the color on doesn't do anyone any favors. Paint one thin coat, wait just a couple of minutes and then go back and paint a second coat. Wait a few minutes and then paint on your top coat, generously, over the whole shebang. "But wait!" you say. "Your nails are a total mess!" Yep. And that's just fine. The other advantage to painting my nails at night is that I don't have to worry with cleaning up the edges. The next morning, when I shower, the excess polish comes right off. Usually just the process of shampooing and cleaning is enough to knock most of it off, but sometimes I have to use my fingernails in the shower to scrape off the last remaining bits. It's easy and my fingernails look dandy when I'm done. And there you have it! That's what I do each and every week for my home manicure. I find that keeping my nails short helps keep them from chipping as much, and the biggest change in how they look during the week is from growth at the base. Otherwise, they look perfectly respectable, I'd say. Have fun and enjoy painting! *Disclaimer: Your manicure might not last all week. Depending on your level of activity and type of polish, you might have some chips. I'm not saying that your manicure will look exactly the same as it did when you completed it, but it should look totally acceptable if you're using these products and methods and aren't a lumberjack who doesn't wear gloves. I think the idea of ritual is manditory! I kinda have the same philosophy, except I am a Sunday afternoon toe girl. I love the solid color, because I don't have time for the fancy designs either. I do it because who wants to see my funky toes in sandals at the office. I type too much for anything more then a clear top, that I touch up after brushing my teeth. If you could find a solution for the office oppressed, that would be awesome. I thank you for the blog and have a good night. Ok, you got me with "take an hour of no-multitasking self-care". Tomorrow night, I'll polish! But what about us lumberjacks, Rachel?! I'm very similar. I don't really wear make up or fuss with my hair but I've always enjoyed my weekly nail ritual. It's relaxing and even kind of a creative outlet, in a weird way :). I'm planning to do mine tonight! AWESOME. I have never been a big fan of painting my nails because of how difficult it is to remove polish, paint in the lines, etc. This post has given me hope for a better way - thank you so much!! I've never seen that kind of nail remover, looks so awesome. Glad painting your nails lets you just rest and relax for a bit. Must be very nice. What a great post. So many amazing photos with the fingers. 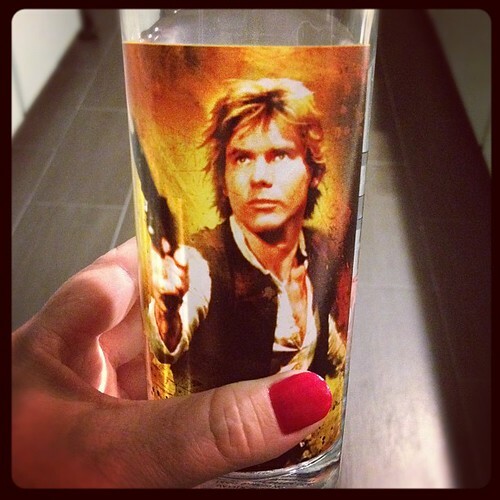 And love the Hans Solo glass. My girls and I RAN out to Walgreens and then Sally Beauty Supply to get the supplies last night. Did my nails during the last half of Law and Order. It worked! Today my nails are GORGEOUS! Thanks! The last couple of months I've gotten into painting my nails in a way I never have before--usually it's the thing I grudgingly do before a board meeting or a wedding. But I saw a photo of the newsprint transfer nails online (damn you, Pinterest!) and had to do it. Now, like you, it's a relaxing self-care ritual, usually while I'm watching Netflix or Hulu. That sponge-in-a-container stuff was crazy, wasn't it? This Target stuff is so so so much better. Love it so! I'd like to see a bit more leg in that first photo, please. RAWR! It's a great indulgence to have! I need to get better about setting a schedule for pedicures. I can't do a pedicure on myself like I do these manicures, and man ... do I like to have my toes lookin' pretty! Here's my problem: I can never seem to get the second coat on properly. Even if the first coat goes on ok, the second will either go on too thick and end up beading, or if I try to put it in thinly it'll skip. This happens whether I use new or old polish, whether I wait hours before applying the second coat or do it right after the first. This is why I gave up on my nails years ago... until I saw your fabulous pics on IG! Got any suggestions? Hmm ... I was going to say "make sure the polish is newer" but then saw your comment about new/old.... Perhaps these things: make sure it's a good quality polish. It's kind of like painting walls: if you use a good quality paint, it goes on easier and covers better, right? I'd try sticking with some good polishes for now, at least. 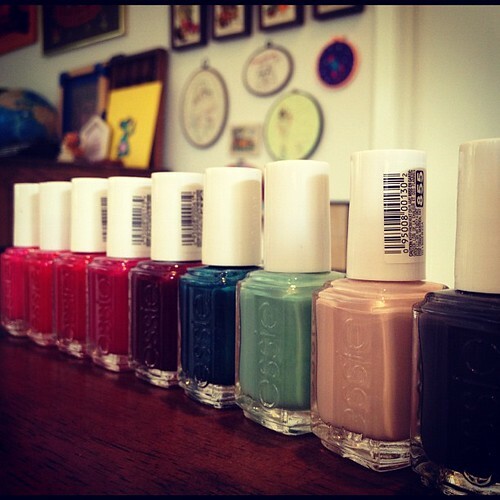 OPI, Essie are great, and the Sally Hansen Xtremewear is good for a less expensive polish (about $2 at Target). Have you tried when you've used a good base coat clear polish like I mentioned here? That may help, too. Otherwise, I think it's a practice thing. This definitely got better with time for me. Initially, my nails looked like crud, but the more I did it, the better and easier it got. That's where the doing nails 1-2 times per week helps ;) Keep practicing and let me know how it goes! This is the funniest post I have read in ages! I love the Star Wars references and it's great to know that I'm not the only one who makes immature Sarlaac jokes! 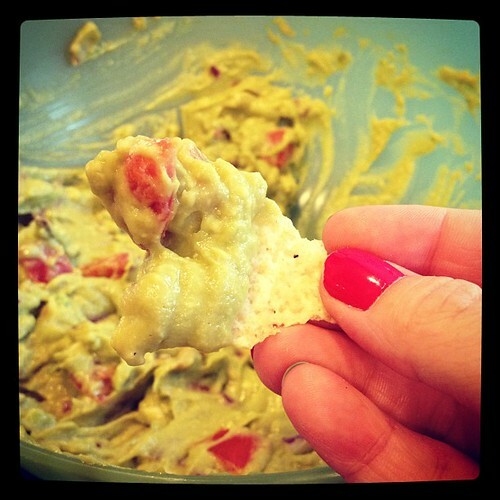 I have one of the yucky sponge dip in things and that one looks SOOOO much better. I'm also not at all a girlie girl but I like my nails polished. I love color and craziness and seeing it on my fingers makes me happy. It's not really rational but who cares, yay colors! I loved seeing your routine. I'm going to have to try it out. I would love to go more than a few days without my color chipping.